Molton Brown will launch Mahina, a new "cheerful" floral addition to their Navigations Through Scent series, in February. The scent was inspired by the Tahitian region of the same name. Mahina was developed by perfumer Jennifer Jambon; notes include ylang-ylang, orange blossom, tiare flower, vanilla and cedar. 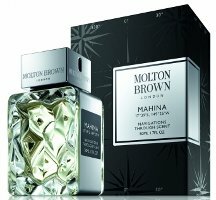 Molton Brown Mahina will be available in 50 ml Eau de Toilette. I will smell this when I have the chance -I have a weakness for this sort of perfume. If it’s a tropical floral, chances are I will like it!